Total Run Time: 77 min. 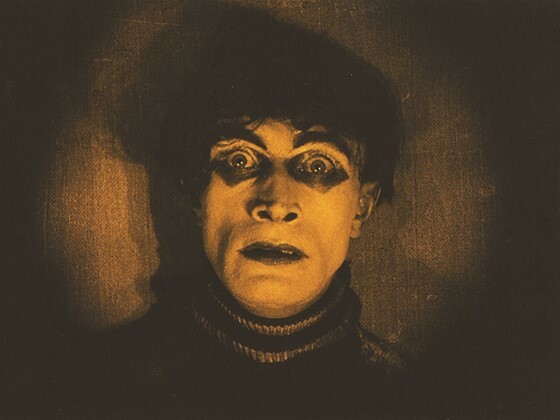 The quintessential German Expressionist film, Caligari takes place in a disorienting landscape where a mad doctor (Werner Krauss) and his sleepwalking captive (Conrad Veidt) commit a series of murders. Writer Michael Atkinson writes, "If cinema came to be the troubled, fanciful, sensual, neurotic unconscious of human culture in the 20th century, feeding us lurid, wild images and scenarios in response to our twisted inner hungers and greatest fears as we simultaneously feed it history, phobias, narcissism, prejudices, and lust—if then, The Cabinet of Dr. Caligari is something like the first nightmare, the first cave painting on the dank walls of modernity." One of the most studied and influential films ever made! Club Foot Orchestra was founded in 1983 by composer/musician Richard Marriott. Named after San Francisco's Club Foot nightclub in the Bayview district where they were the house band, the Orchestra became a pioneer in creating modern music for silent film. Their accompaniment is thoughtful and expressive, showing respect and engagement in the images they compose for. The New Yorker writes, "This is music that bubbles up from the intersection of aesthetics and the id." Members of the Club Foot Orchestra include (in alphabetical order): Will Bernard (guitar), Sheldon Brown (woodwinds), Beth Custer (clarinets), Kymry Esainko (piano), Chris Grady (trumpet), Sascha Jacobsen (contrabass), Richard Marriott (trombone, winds), Deidre McClure (conductor), Gino Robair (percussion, marimba), and Alicia Rose (violin). Click here to buy an ALL DAY PASS.